France was the first country in the world with which India signed a strategic partnership in 1998; between French President Jacques Chirac and Prime Minister Atal Behari Vajpayee. Indian space scientists received initial training in France after Pokhran-II, France recognising India as responsible nation while balance West blocked out India. 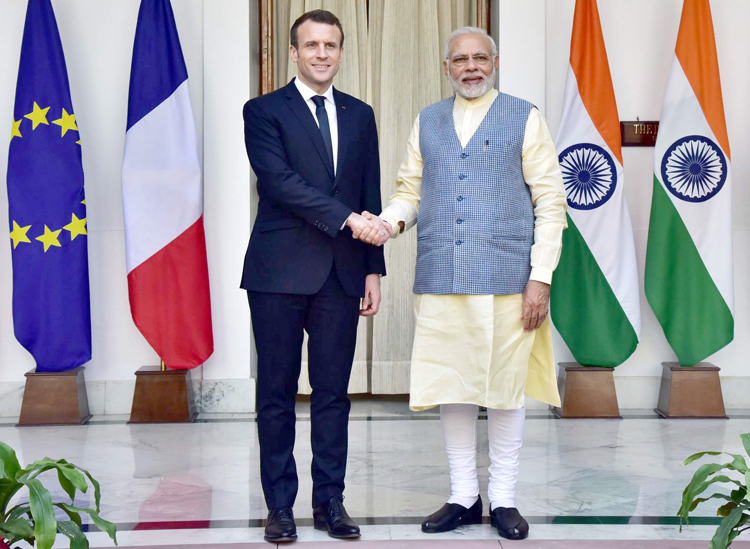 French President Emmanuel Macron’s recent four-day visit to India in March 2018 coincided with 20 years of the strategic partnership between the two countries. President Macron arrived at New Delhi on March 9 accompanied by his Brigitte Marie-Claude Macron (First Lady of France), businessmen and top officials. President Macron met President Ramnath Kovind and held discussions with him. President Macron and Prime Minister Modi held discussions on how to further enhance ties between their two countries including in key areas of defence, space and civil nuclear cooperation. This was followed by delegation-level talks between the India and France led by the two leaders, exchange of agreements, followed by a joint press statement by by President Macron and Prime Minister Modi. Later Macron attended a CEOs forum, interacting with industry heads and top CEOs. Macron also interacted with students from across India in another event. The International Solar Alliance (ISA), co-chaired by Prime Minister Modi and President Macron, was formally kicked off in presence of heads of state of 23 countries and ministerial representatives from 10 other nations, with 62 member-countries adopting the ‘Delhi Solar Agenda’ seeking to raise the share of solar power in their energy basket with a view to mitigating climate change and providing clean, affordable electricity to the underprivileged. President Macron and Prime Minister Modi also visited Varanasi and later Mirzapur in UP to inaugurate a 100 MW solar power plant - the largest in Uttra Pradesh. Defence cooperation between France and India has been growing steadily too. The multi-billion dollar deal for 36 Rafale fighters was signed in 2016. France remains a major partner for India in developing various key military platforms including the Scorp�ne submarines. During the visit of French Defense Minister Florence Parly in October 2017, foundation stone for the Dassault Reliance Aerospace Limited (DRAL) manufacturing facility was laid at Mihan in (Maharshtra); joint venture France’s Dassault Aviation and Reliance Group - first private facility for production of Rafale fighter jets and Falcon civilian aircraft. The two navies regularly conduct joint exercises and their scope has been widening over the years. The ‘Varuna’ series of joint maritime exercises began in 2000 and have become integral to institutionalised interactions between the two navies. 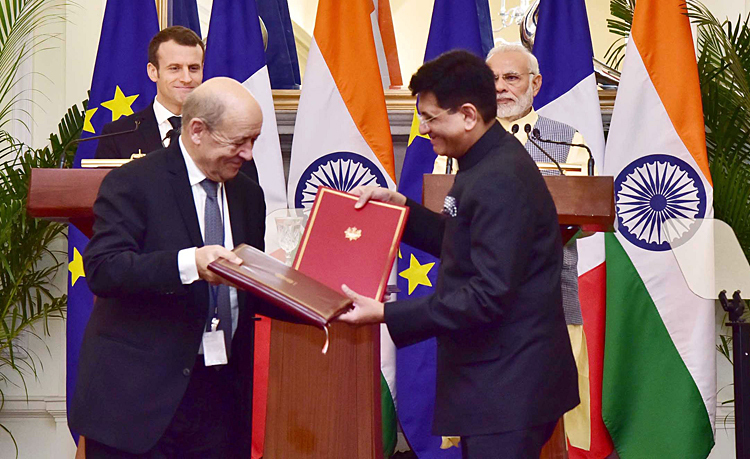 During President Macron’s visit, India and France inked 14 key agreements in strategic areas of security, nuclear energy, and protection of classified information, while companies from both countries signed contracts worth $16 billion. The agreements, included those in the field of defence, education, environment, urban development and railways, etc, details of some of which are: agreement for Exchange and Reciprocal Protection of Classified or Protected Information; agreement for annual defence dialogue at ministerial level; agreement for provision of reciprocal logistics support between their Armed Forces extending logistical support on reciprocal access to respective facilities for Indian and French armed forces; agreement on Prevention of the Illicit Consumption of and Reduction of Illicit Traffic in Narcotic Drugs, Psychotropic Substances and Chemical Precursors; Way Forward Agreement between NPCIL and EDF for the Implementation of six nuclear power reactor units at Jaitapur, Maharashtra, India; bilateral partnership agreement on migration and mobility, to facilitate student and professional mobility between both countries; agreement for mutual recognition of degrees, to facilitate pursuit of higher education and enhancing their employability; signing of a Statement of Intent between the French Ministry for Ecological and Inclusive Transition and NITI Aayog, supported by French technical assistance provided by French Development Agency (AFD). President Macron said, “We want India as our first strategic partner here, and we want to be India’s first strategic partner in Europe, and even the western world.” France supports India’s bid to the NSG and UNSC and both countries share common concerns and objectives in the field of non-proliferation of weapons of mass destruction. (Left) President Ram Nath Kovind and Prime Minister Modi with President Emmanuel Macron during the ceremonial receptionat the Rashtrapati Bhavan in New Delhi; (right) Prime Minister Modi and President Macron at the Founding Conference of the International Solar Alliance at Rashtrapati Bhavan in New Delhi. Both have reiterated their support to the Indian Ocean Rim Association (IORA) and the values it promotes, and commitment to proactively contribute towards the priorities of IORA. 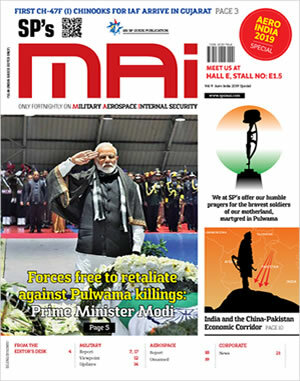 China’s militarisation of the Indian Ocean is cause of concern for both India and France, even as India is redefining its strategic space in the Indo-Pacific. 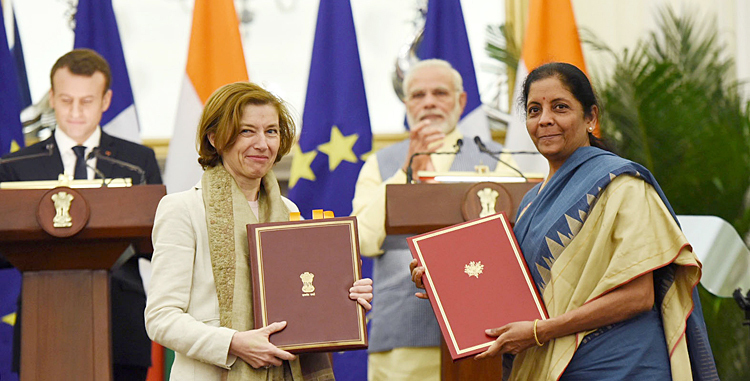 Signing of the agreement for granting reciprocal access to facilities of both counties allows India logistics access to French military bases in Djibouti, Abu Dhabi, and Reunion Island, which will be important definite force multipliers. France has always maintained an independent policy including with the US and NATO. It will not like to join the ‘Quad’ comprising India, US, Japan and Australia. But notwithstanding that close bilateral Indo-French bilateral partnership is significant for both countries. In the absence of a security architecture for the Indo-Pacific to ensure security of SLOCS, global commons and the region, interoperable navies that can use each other’s naval facilities is certainly the best substitute. But this being just one part, the India-France strategic partnership has great potential to keep going from the next to next level.